The celebrity endorsement of cosmetics is nothing new. 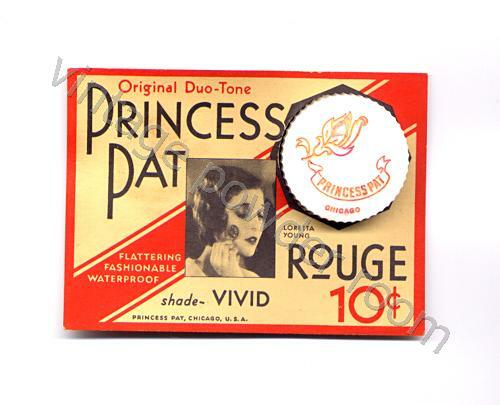 The Princess Pat rouge card featuring a photo of the lovely actress Loretta Young is a fine example of an early relationship between a cosmetics company and a Hollywood star. 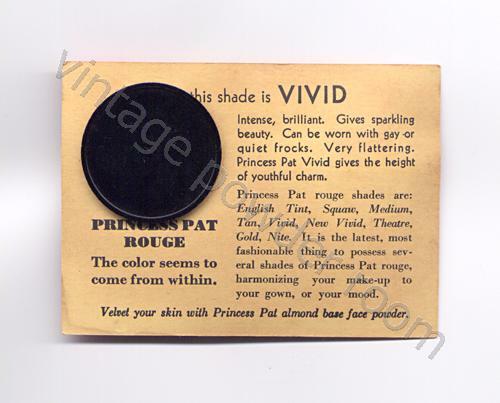 Princess Pat used many Hollywood actresses to endorse their products, and I’ll be highlighting some of them in future posts. The rouge card on which Loretta Young appears dates from the late 1920s to early 1930s when she had begun to establish herself as a major star. Loretta was born Gretchen Young in Salt Lake City, Utah on January 6, 1913. Her parents Earl Young and Gladys Royal had married impulsively as teenagers in 1908. Early in their marriage Gladys suspected that Earl was being unfaithful; so after several years of strife, and four kids, the couple separated and Loretta’s mom moved the family to Southern California where she ran a boarding house. 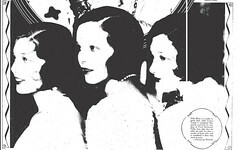 Shortly after their move to Los Angeles Loretta’s older sisters Polly Ann and Betty Jane began to appear in silent films, and Loretta would soon follow. Loretta’s first (uncredited) movie role was that of a fairy in the 1917 film “The Primose Ring”. 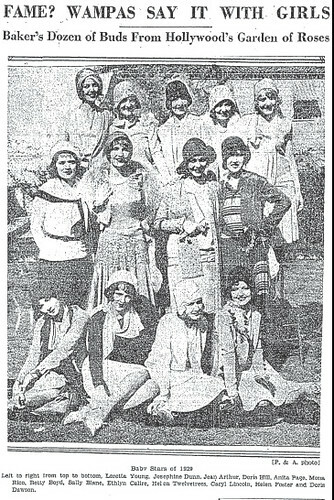 In 1929 Loretta, as well as her sister Betty Jane (who was using the name Betty Blane), were pegged as two of the thirteen girls selected by members of the Western Moton Picture Advertisers (WAMPAS) to be baby stars. WAMPAS had been naming girls for the honor since 1922, and from their ranks rose some of Hollywood’s biggest names. Mary Astor, Joan Crawford, and Fay Wray were three of the thirteen picked in 1926! Quite a stellar line-up. One of my favorites of the WAMPAS baby stars was Sally Rand. Rand was chosen in 1927, and by the 1933 Chicago World’s Fair she was working steadily in burlesque. Sally was famous for her fan dance, and for the bubble dance, which she is credited with developing. The annual WAMPAS Frolic, the event at which the thirteen young Hollywood hopefuls were feted, came to an end in 1934. The reason for its demise was primarily due to the studios creating their own awards for up and coming starlets — stealing thunder from WAMPAS and diluting what had once been a more exclusive honor. Loretta would have succeeded even if she’d never been chosen by WAMPAS. She was beautiful, with amazing cheekbones, and she was also a very talented actress (she won an Oscar in 1947 for her performance in “The Farmer’s Daughter“). She starred opposite Spencer Tracy in his first Hollywood leading role in the 1933 film “Man’s Castle”. Spencer was married and 13 years her senior, but that wouldn’t have made him any less attractive to 20 year old Loretta. He was a charmer and he was Catholic. That she and Spencer shared a faith would have been important to her — of course it would also be one of the many reasons why the two couldn’t pursue a permanent relationship, and Loretta said as much in a 1934 public statement. In 1935 Loretta was working opposite the “King of Hollywood”, Clark Gable, in “Call of the Wild”. Loretta may have been seeking love and romance, but the married Clark was probably looking for a diversion from his marriage. The two had an affair and Loretta became pregnant. During her last trimester she and her mother went to Europe, and it was there that she gave birth to a daughter, Judy. That the child was Gable’s was not the best kept secret in Hollywood, but times were different then and Loretta was never directly confronted by the press. Having a child out of wedlock in the 1930s, public figure or not, was a difficult situation. Further complicating matters for Loretta would have been her ambitions for her acting career and her religious beliefs. Her solution was to place Judy in a foundling home for about a year until she could formally adopt her! Judy’s true parentage remained an open secret, but she didn’t get the details first hand from her mother. She was 23 years old and about to be married when she heard the story from her fiancee for the first time. She had told him that she couldn’t marry him because: “I don’t know who I am.” He told her that he knew everything about her, and that she was Clark Gable’s daughter with Loretta. On the advice of a priest she didn’t confront her mother about it at the time. She would wait for nearly ten years until she finally approached her mother and started to ask questions. Loretta came clean, but asked Judy to keep the secret — which she did. Loretta would not publicly confirm the story until she wrote her autobiography, and even then she asked that the book be published posthumously. Loretta passed away in Palm Springs on August 16, 2000.